Tarantulas make great pets. Not only are they beautiful, majestic creatures, they are clean and easy to keep. Once you have set them up in an appropriate tarantula housing their needs are easy to fulfill. So how exactly do you create an appropriate habitat? Not all tarantulas are the same; some dwell in trees while others prefer to stay on the ground. In this article we’ll take a look at the different habitat requirements and help you choose the best home for your pet. 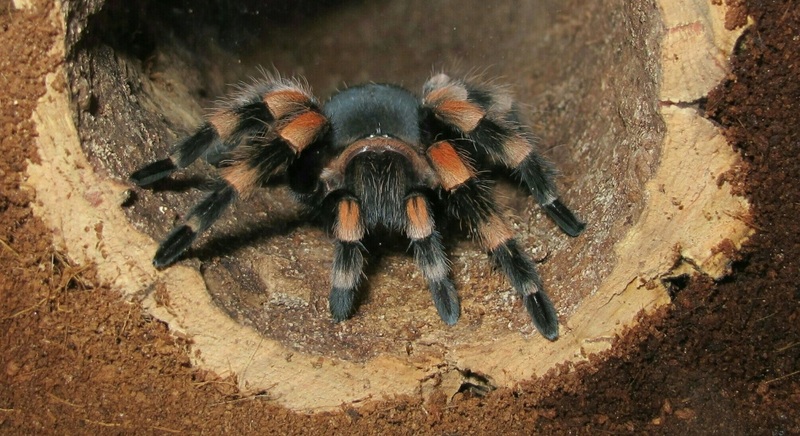 The following describes considerations to consider when housing your pet Tarantula. Let’s start with the material of the tarantula housing itself. Most terrariums are made out of either plastic, acrylic or glass. Though plastic is cheaper and more resistant, it has the tendency to become opaque over time; a problem you won’t face using a glass habitat. A nice and cheap alternative, especially if you are able to make them yourself, would be acrylic. Acrylic habitats have a number of advantages. As said you can make them yourself very cheaply, but also, they are a lot lighter than glass enclosures. Another benefit is ventilation, if you need to add ventilation to an acrylic habitat, it is easy to drill some extra holes. They are also very durable and won’t break as easily as a glass enclosure. They might scratch, like their plastic counterparts, but for acrylic habitats there are a variety of products available to polish them and remove scratches. The size of the enclosure will depend a bit on the type of tarantula you own, for most terrestrial spiders 30x30x30 is more than enough. For ground dwelling spiders you won’t want to get much higher than that as they sometimes climb the glass and a fall might damage their abdomen and possibly kill them. With the exception of the Goliath(Theraphosa Blondi), this specific spider is so large it will require a larger habitat, not higher but definitively larger, around 60×40 should do. For spider that live in trees you might want to opt for 20x20x40 (LxWxH). Tree dwellers often make different kinds of webs, they will like to climb branches and will appreciate the higher enclosure. There are several ways you can make the opening in to the enclosure. Personally I’m a big fan of the doors that slide up, more common however, are doors that slide to the side. If you choose the latter make sure to get a lock as well, you would not be the first person that has to search his house for a missing tarantula. If you own an Aboreal Tarantula species it may be wise to consider a taller enclosure. This will allow the spider to climb higher, build more web and generally feel ‘more at home’. A taller enclosure can also reduce the likelihood of disturbing the web. 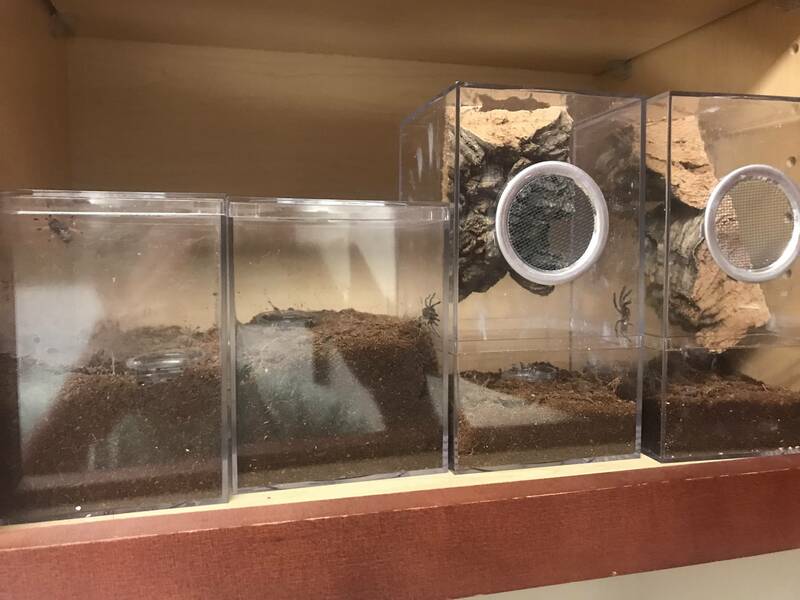 Burrowing spiders can also benefit from a taller enclosure, simply fill the bottom of the enclosure with more substrate and watch your pet burrow down deep! Pet owners often find a standard terrestrial enclosure is enough as the spider rarely builds any webbing higher up the cage. Below is photo showing 2 terrestrial terrariums vs 2 aboreal terrariums. When it comes to climate there are three important things to consider, temperature, humidity and ventilation. Here it is very important that you research where your tarantula originates. Tarantulas can be found on all continents (with the exception of Antarctica) and though they tend to favor warm climates the differences between their natural habitats can differ enormously. Once you have established where your spider is from, you can think about how to create a climate that is fitting for your spider. Humidity can be controlled in a variety of ways, the simplest being spraying with a plant mister bottle. It is advisable to choose a type of soil that matches your needs regarding humidity. Certain types will hold humidity a lot longer than others, for spiders that originate in tropical climates it is wise to choose a type of soil that holds humidity well, does your spider come from a dryer region it s better to select one that let’s humidity through easier. Another thing you might want to consider is placing a small metal ventilation strip, this can help prevent too much humidity building up. When housing your pet Tarantula humidity can build up in your enclosure, it might cause the enclosure to fog up. Not only does this make it impossible to see your pet it also can cause fungi to grow in your pet’s habitat, not good! Temperature is the second item when it comes to climate control. Most spiders come from warm regions, the tropics, subtropics, deserts, etc. That means that the average temperature of your home might be a bit on the low side for them. Heating the habitat will create a climate that is more pleasant for the spider. This can be done either by the use of a lamp or by using heating mats. The benefit of the latter is that there are some mats available that have a thermostat that allows you to exactly control the temperature in the habitat. Their downside is that they are a lot more expensive than working with lights. When choosing for lamps you have to make sure that it is strong enough to heat the habitat adequately but not so strong that it raises the temperature too much. Also keep in mind that when using lights you can’t just turn them off at night, when you want to sleep. If you have your tarantulas in the same room where you sleep, heating mats might be a good choice. And then there is ventilation, many species of tarantulas require very little to no ventilation, but there are a few that require a lot. When dealing with Avicularia species (Pink Toe, and others) there is a greater need for ventilation. With these spiders it would be wise to get cross ventilation going in your habitat. Remember though that with more ventilation there is a tendency for the temperature and humidity in your enclosure to drop. If they do drop below acceptable levels, you can try experimenting with closing part of the ventilation holes and see what the effect on temperature and humidity is. When housing your pet tarantula substrate fills an important role in your terrarium and you should carefully consider what type to choose. As mentioned above, certain types of substrate can help you regulate the humidity in your enclosure. And the different types of substrates all have their pros and cons, try to choose the kind that best fits your pet’s needs. One type is substrate that is very popular nowadays is coco fiber. Coco fiber is ground up coconut and can be found in most stores that deal with exotic pets. One of the great benefits of this material is that it can be used for both humid and dry habitats though it does have the tendency to dry quickly. Good for spiders from arid regions but something you need to keep an eye on if your spider comes from a more humid area. If you have a spider that has the tendency to burrow this might not be the best choice for you as the material can become fluffy when dry. Also if you have larger habitats this might not be the most economic option. Another great option that retains humidity well is top soil. This can be found in most gardening stores and is very inexpensive. If you are making a larger habitat it does have the tendency to become heavy very fast. Make sure you select one without fertilizer though. The quality might differ greatly as well and some come with rather big chunks that you will need to break down before using it. When using topsoil you also want to keep an eye out for fungi. Composted bark is another good option. It holds humidity fairly well and if you have the extra fine variant it is very suitable for burrowing tarantulas. Though you have to be careful to make sure there are no sharp pieces left in the bark, as this might seriously hurt your spider, this is especially relevant in the less fine variants of composted bark. If you read older books or texts on what substrate to use for your spider habitat, you will probably come across texts talking about vermiculite. It was very a very popular choice because it was free of bacteria and fungi resistant. Nowadays it is not used often anymore because it has some negative qualities when used pure, such as becoming a bit sponge-like. You can still use it as an additive in enclosures for spiders that like higher humidity and/or are prone to burrowing. There are many other options, such as peat, moss (as an additive), wood chips, etc. When talking o other owners they might come with different options or combinations of several different products. Some people will warn against wood chips as they might create splinters and harm, or potentially kill, your pet, but in very humid enclosures this poses less of a risk. Peat moss is not a very environmental friendly option, as it is harvested from wetlands that are crucial to the ecosystem. It does however come free of bacteria and can hold up to 20 times its own weight in water, making it a very attractive substance to use as an additive for substrate in a tarantula enclosure. There is not one perfect choice when it comes to substrate. As you can see the considerations range from price, proliferation of bacteria and fungi to environmental. Think about what your spider needs and base your choice on that and experiment if need be until you find something that fits both your spiders needs as well as your own. There is a reason you don’t often see spiders in the wild, and if you do see them often be sure that for each one you see there are dozens, if not hundreds, more that you don’t see. Tarantulas love to hide and your enclosure should have a space where your spider can retire to if she feels the need. There are many things you can place in your enclosure for this purpose, stones for instance, pieces of wood, bark or plant pots. When creating a space for your spider to hide in make sure that it is big enough, but also take in to account how it will look. Your spider will be fine hiding in half a plastic plant pot but you will need to look at it, so you might want to go for something that creates a nice dark niche for your spider but also is pleasing to the eye. Having an adequate water supply is vital for your spider. Tarantulas require water for webbing and though they get a certain amount of liquid from their prey that alone is not enough for the amount of webs they make. When selecting a dish for a water supply, size is very important. It does not need to be deep, but try to find a dish that is big enough for the spider to submerge the front part of its body, the Chelicera. You probably won’t see your spider drink often but it is important to always have some fresh water available just in case. Cleaning your enclosure should be done about two or three times a year. Tarantulas are very clean animals and cleaning more often is unnecessary. The first thing you should do when cleaning the enclosure is take your tarantula out,make sure your tarantula is not molting as this might make it more aggressive. One you have have taken your spider out and put it in a adequate temporary enclosure, you start removing all the items from the enclosure, the decoration, water dish, etc. These you scrub clean and set aside to dry. You then remove all substrate from the enclosure and dispose of it Do not reuse it as there might be droppings and/or remains of prey animals in there. Then wash the habitat, you can do this normally with water and soap. Once the habitat is dry, you replace the substrate, put all the items back in place and move your pet back to his home. We already discussed lighting as a way of heating your enclosure, but lighting can serve another purpose as well. In combination with decoration, lighting can transform a simple habitat to an amazing decorative piece in your house. With climate, substrate, a hiding place and water taken care of you took care of all your pet’s basic needs (without counting feeding of course). The lighting and decoration are mostly for you as owner. So what way to go with decoration? This depends for a large part on what you prefer looking at when you are at home. There are, however, a few things to keep in mind. Sharp objects might be harmful to a spiders abdomen and therefore better avoided. When placing stones as decoration it might be wise to keep them away from the outer walls of the enclosure for the same reason. Spiders will climb the glass and sometimes they do fall, falling on a hard surface increases the chance of hurting the abdomen. Some people choose to have actual plants in the habitats. Though this can look amazingly beautiful you have to take in to account that it will also cause a bit more work to keep your habitat clean. High humidity and organic material are a great breeding ground for fungi and bacteria. If you are looking for easy maintenance plastic plants can give almost the same effect. For tree dwelling spiders you can use branches or big pieces of wood. When working with wood make sure that it is well dried before placing it. Just selecting some from your garden may again lead to fungi and bacteria. As you can see there are a great many things to take in to account when creating your perfect habitat, the needs of your spider but also your own demands. A great enclosure does not need to be expensive and when done properly a tarantula in his habitat is more than just a pet. It is something that, if you are like me, you can spend hours looking at. Good luck and enjoy!